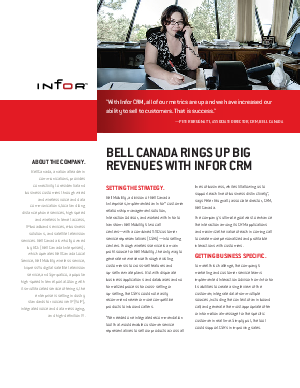 Bell Mobility, a division of Bell Canada Enterprises, implemented an Infor™ customer relationship management solution, Interaction Advisor, and worked with Infor to transform Bell Mobility’s two call centers—with a combined 550 customer service representatives (CSRs)—into selling centers. Though wireless service is a main profit source for Bell Mobility, the only way to generate new revenue through existing customers is to cross-sell features and up-sell new rate plans. But with disparate business applications and databases and no formalized process for cross-selling or up-selling, the CSRs could not easily recommend newer or more competitive products to inbound callers. “We needed one integrated recommendation tool that would enable customer service representatives to sell our products across all lines of business, while still allowing us to support each line of business distinctively”, says Peter Brugnatti, associate director, CRM, Bell Canada.